As explained in TPC Structure#1: Leadership, just as important as How to Lead is Who Leads. The Pub Club’s success has been due to the fact that it is Student-Driven and PI-Supported. The Purpose of The Pub Club as stated in the TPC Mission is: “to support and assist postdocs, grad students and undergrads in reaching the objectives they, their committees and their PIs have set for their time at University and beyond.” It is this purpose that makes who leads so important. What began as a Great Experiment based on a loosely defined hypothesis quickly produced results (data) revealing what worked well and what did not. These results helped expand and refine The Pub Club Mission statement and operation into the actual structure that TPC follows today. It was consistently shown that those receiving the greatest benefit were the most active participants. This participation came from a personal desire to be involved, not an external mandate. 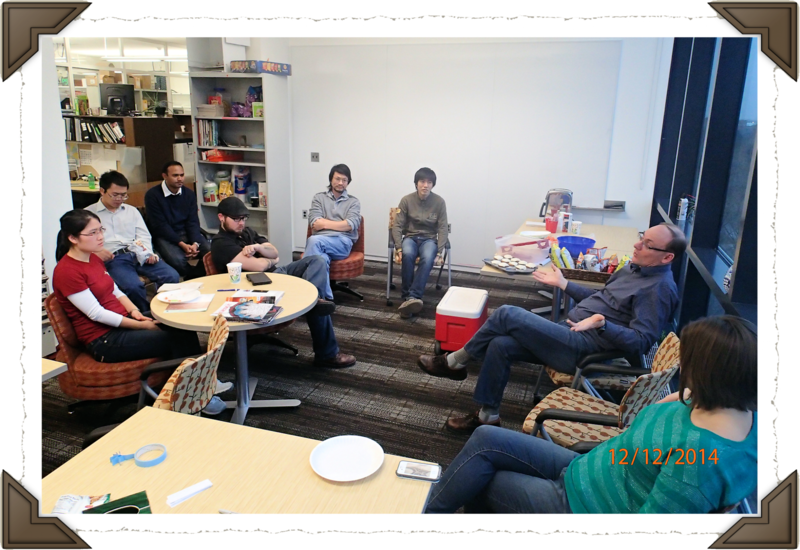 The student/postdoc community has plenty of mandated interactions, including seminars, journal clubs, lab meetings, etc. The secret to TPC’s success is the choice to be a part of it. This personal connection to the community that is The Pub Club produces topics and discussions that are of interest and of use to individual TPC members. Those who commit to leadership positions in any TPC must remember this and maintain the Student-Driven/Led structure without exception. Yes, Student-Driven is a must, but the second part, PI-Supported, is just as important. While it is true that participation must be chosen by the students and cannot be mandated, it is also true that a PI’s opinion on how we spend our time is the primary influence in how we choose to spend it. If a PI is not outspoken about their support, it is assumed they do not support it. 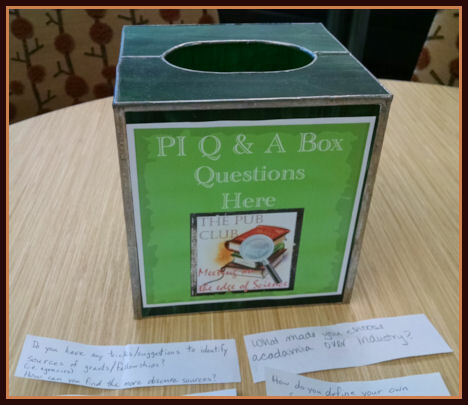 The flip side is that if a PI expresses their belief in the value of something, the student is far more likely to feel comfortable choosing it. Even more, one of the top stated reasons members participate in our TPC is the relaxed access and interaction with not just their PI but others as well (see The Mug Club). Therefore, it is essential that the students driving TPC garner not just support from PIs, but, whenever possible, active participation from them as well. 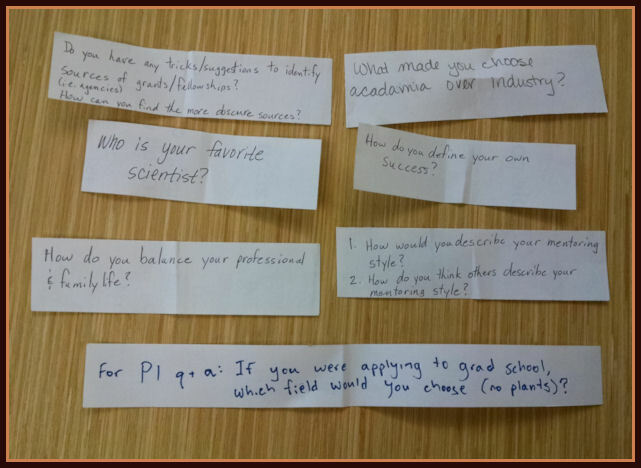 12/12/14 – PI Gregg Howe shares his wisdom at PI Q&A Day, PIs Sheng Yang He and Brad Day are also in attendance to answer questions. Thanks! and on Q & A day questions are drawn randomly for the PIs to answer. This is one of our most popular gatherings, but it only works because students drive it with questions and attendance and PIs support it with attendance and answers. On its own, Student-driven/PI-supported is still not enough. In order to benefit from what the Community of Minds concept has to offer, The Pub Club must also be member supported. Simply stated, if members only come when they are leading the conversation or when the topic directly relates to them, who else will be there to hold those conversations with? So, while a successful TPC cannot require attendance, it does require active participation in order for members to fulfill their personal objectives. Showing up just to take and not contribute will always result in losing the opportunity to do either. The Meeting: The Pub Club holds weekly, informal gatherings to provide post docs & students with access to professors, peers and other professionals to share information on scientific breakthroughs, to generate and exchange ideas, to solve problems and to discuss topics relevant to being successful scientists. Properly run by “active participants,” The Meeting also provides a chance to learn basic leadership, budgeting, organizational and communication skills. A tool without a committed craftsman guiding it can produce nothing but scrap. Likewise, The Meeting, or anything else The Pub Club does, will produce no results without the committed, active participation of its members. Contact form at the bottom of the Mission page. Guide to Finding your Career Goals: by ASM Careers → ← TPC – Will History Repeat?